WELCOME TO THE 2019 SHOOTER’S CHOICE GUN, BOW & GEAR RAFFLE! *Shooter’s Choice 15-day raffle winners determined by corresponding PA Daily Number, Evening Drawing-Straight, for May 1-15, 2019. For more information contact Jarvis Green at 717-793-1422 or visit HopewellFishAndGame.com/ShootersChoice. Prizes for each day are listed below. 14 Winners get to choose from assorted prizes. One lucky bonus winner will win a limited edition knife collection valued at over $1000. Winners will be notified by mail, phone or email based on information provided on the ticket form. Prizes pictured may not match exact giveaway items. Photo ID and ticket stub are required to claim prizes. Donations benefit Hopewell Fish & Game Association for use in improving our club&apos;s amenities for public events. Tickets will be available until April 30th. To get tickets or for more information, please contact Jarvis Green at 717-793-1422 or JarvisGreen3@yahoo.com. 05-14-19 / Obsession Fixation Compound or Mathews Triax Compound or TenPoint Shadow NXT Crossbow (from Xtreme) or Weatherby Vanguard S2 Sporter Bolt 30-06 with Leupold VX Freedom 4X12 Scope (from Hake’s). 05-15-19 / Bonus Prize - North American Fishing Club Limited Edition Knife Collection donated by Rick Leader of Hopewell Fish & Game - THANK YOU RICK! 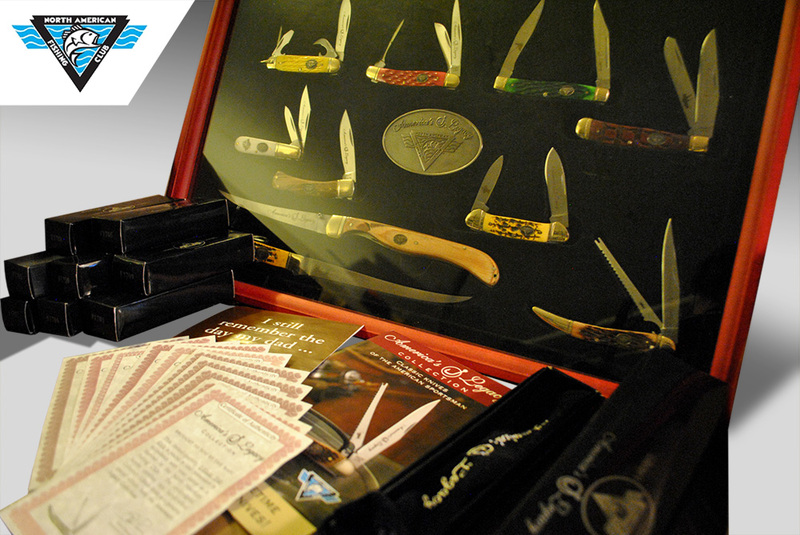 Knife Collection Includes:10 limited edition knives, each with their own certificate of authenticity and box, North American Fishing Club belt buckle, original literature and shadow box display case.